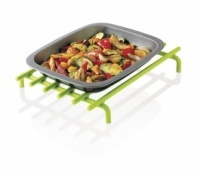 Brilliant small silicone flexible coaster or trivet by CKS Zeal. This colourful silicone hot mat or coaster is the perfect size for a teacup, jug or small pan. Use it to protect your work surface or table, or use on a tray to provide a non-slip surface for your cups and plates. Easy to store and use, now just choose your colour.